Congratulations to Polly Netto of Bath who passed her practical driving test 1st time, on the 8th August at kingswood test centre in Bristol. Polly was nervous on the day, but put her training to the test and passed with very few minor faults. 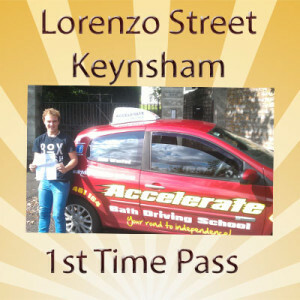 It was a pleasure to teach you to drive,I hope you enjoy your new found freedom, all the best from Saint Stephen at Accelerate Bath Driving School.